Yeah! A spare day is always nice. 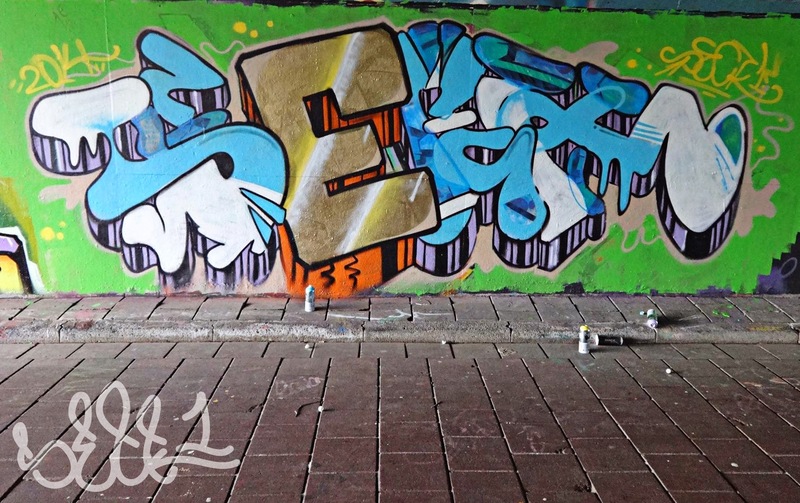 This thursday was planned for only one thing, dropping some graffiti artworks at the Berenkuil in Eindhoven city. So we did! We met up at Rotterdam CS to get to Eindhoven 'what a surprise' by train. After spotting really nice pieces by 3MERS, HOTUS and DMG we entered the south side. Hehehe. There was only a lil' walk left to Berenkuil, but packed with 15 cans 'o paint per individual it was harder than I thought.. But we're still alive. Really really dope spot, I saw some pieces from international artists like Sofles & Ewok (from the famous Ironlakfilms channel on youtube). It was hard to find more 'toy' writer in between those kings, but we found a couple. It still felt like it was a bad decision even after. Wow what a place. You guys should search for some photos on google or something.. Such beautiful work. We didn't really do a collabo, but it was more a day off with school friends / graffiti writers. We all did our own thing, but nonetheless it was really pleasant. Tober went on to a different place but yeah.. He got friends everywhere. Damn. I started off with sketching my outlines and put up some green roller paint after.. I did a freestyle sketch with an golden E. The other letters are just like what I always do, blueish this time. The purple 3d and light-brown and yellow outline finished this thing. Proud of this one.